PHUKET: Six sea gypsies were arrested by Sirinath National Park officials yesterday after being accused of illegally catching marine life in a national park area. One of the six sea gypsies arrested claims that they hadn’t caught marine life as they had been accused of, but had gone into the water to cure Decompression sickness (DCS)*. Last night (Jan 8), Facebook user ‘Chaolay Rawai’ posted a picture of the six arrested sea gypsies along with the message “Urgent..!! #inform sea gypsy friends and media. “Now Sirinat National Park officials have arrested six sea gypsies after they went into the national park area after stopped to treat severe Decompression sickness. “The sea gypsies came back from fishing in Phang Nga. One of them was sick from DCS so they made an emergency stop in the national park area from 10am to 12am for treatment (they went down in the water and slowly came up as is the sea gypsy way to treat DCS). Park officials arrested them and tried to force them to admit to breaking the law and pay a fine of B2,000 to B3,000 each. The sea gypsies did not agree that they were guilty. “The fish the sea gypsies were caught with were caught outside the park area. However, they were taken to a police station. The Justice Fund Office was urgently contacted to bail them out. PS..(The patient was taken to a hospital. ),” the message read. Rawai sea gypsy representative Niran Yangpan followed the arrested sea gypsies to Sakoo Police Station and talked with them. “I confirm that they did not catch fish in the national park area. They were on a fishing boat heading from Khura Buri in Phang Nga after fishing,” Mr Niran said. “When they arrived at Nai Thon Beach, west of Phuket, one of them, Tanongsak Kohngam, 41, had symptoms of DCS. He was dizzy, faint and weak. They had to stop at a shallow area to go down into water. They were arrested there. Mr Tanongsak is now at Vachira Phuket Hospital in Phuket Town,” he explained. After I talked with Sakoo Police I found that they had been pressed with many charges. Bail was set at B50,000 each. They are many offices who lent a hand to help,” Mr Niran added. Chief of Sirinath National Park Chief Witoon Detpramuanphon explained, “In the past three days we have received many tip-offs that marine life was caught inside the national park area near coral reefs and this is what led to these arrests. “We have ordered officials to watch out for people breaking the law. Yesterday morning we were notified that marine life had been caught in the national park area. A team of park officials led by Pongpan Paenoi inspected at 10am. Officials found a fishing boat parked in the area. They were in the water to shoot marine life,” Mr Witoon said. 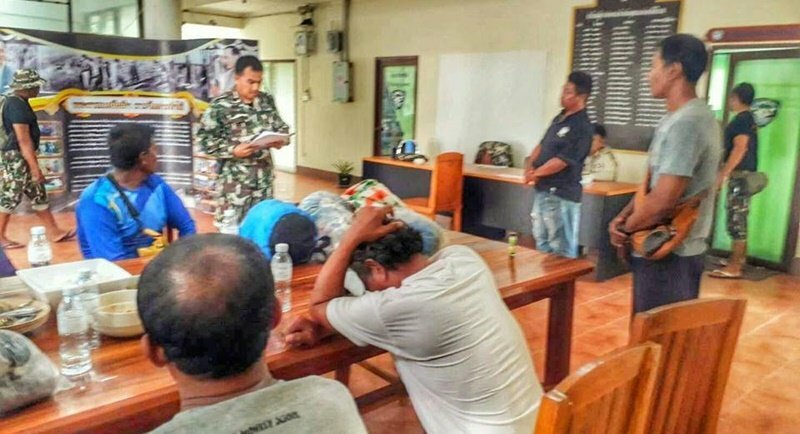 “The six arrested were Panya Kohngam, 46, Pichit Bangjark, 42, Anan Bangjark, 56, Thanongsak Kohngam, 41, Thaweelert Hanthalae, 50 and a minor aged 14. “Officials seized 22 kinds of marine life, in total there were 123 marine animals weighing more than 59.4 kilograms. Officials also seized the boat, air pump, rubber tube, sharp iron rods used to catch fish, snorkel masks and others items. “The six did not mention DCS to officials. “We provided then with food before taking them to Sakoo Police Station,” he noted. “They were charged with violating the National park Act 1961 section 16 (3) taking animals or by any means whatsoever endangering the animals,” he added. “Also Section 16 (13) carry on any activity for benefit, unless permission is obtained from the competent official, section 16 (15) taking any gear for hunting or catching animals or any weapon, unless permission is obtained from the competent officials and the conditions prescribed by the latter have been complied with,” he explained. “Section 18, any person entering the national park must comply with the order of the competent official given in compliance with the rule prescribed by the director-general and approved by the minister,” he added. “The damaged cost B12,738,” he noted. “We confirm that acted according to the law. We did not defame sea gypsies. We intended to protect marine resources. 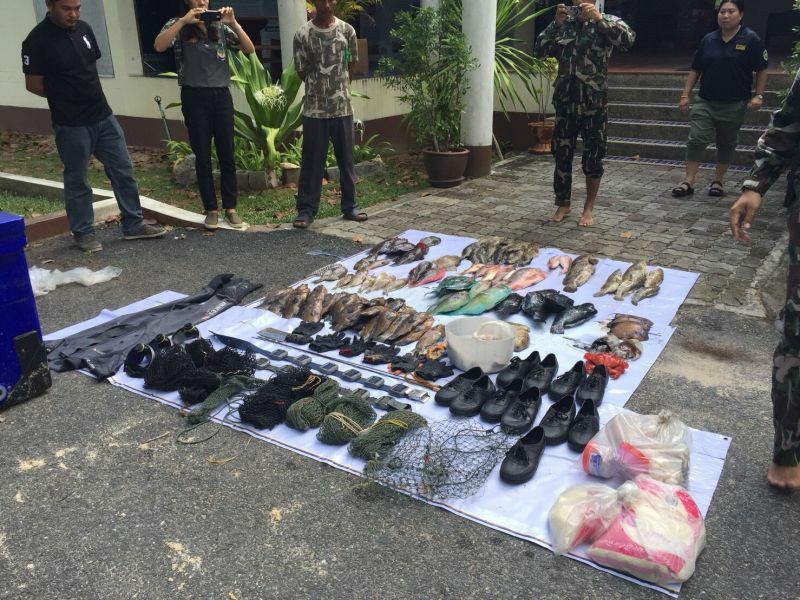 In the past we received a lot of information that marine life was being caught in the national park area, but we were failed to arrest suspects. “The number of marine life has decreased and coral in the national park area is quickly being damaged,” he explained. “If they feel they have not violated the law, they will have to fight the law,” he added.